It provides 100µg of Vitamin K2 and 82mg of Vitamin C per vegetable capsule. Natural Vitamin K2 as menaquinone. It provides 100µg of Vitamin K-2 and 250mg of alfalfa powder per daily dose. It supports bone health. Omega-3 fatty acids with vitamins D3 and K2. 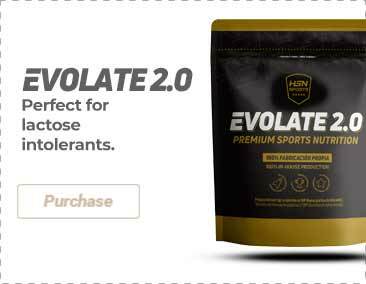 Special edition for athletes. It provides 100mcg of Vitamin K2. It meets 100% of the RDA of vitamin K.
It provides 100mcg of Vitamin K.
Liquid Vitamin K2 and D3 in a bottle with dropper. It provides 75µg of Vitamin K2 and 5µg of Vitamin D3 per daily dose. Multivitamin and multimineral complex. It provides 276mg of vitamin E and 193mg of calcium per daily dose. Why should I buy Vitamin K? 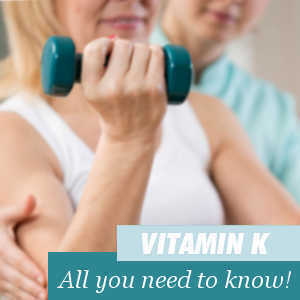 Do I need to use Vitamin K supplementation? Where to buy Vitamin K? Vitamin K is an essential element that is found in plants or produced by the intestinal bacteria. An essential element, in this case a vitamin, is an organic component that contains carbon molecules that are vital for life and have to be supplied externally, through food or nutritional supplements. Vitamin K is a fat-soluble vitamin, which means that they are usually absorbed by chylomicrons (fat molecules that circulate in the bloodstream after digestion), and that travel through the lymphatic system of the small intestine and in the blood flow throughout the body, to be deposited in the tissues and remain in those areas. Note that chylomicrons are made up in almost a 90% of triglycerides, which are the main fat packages transported through the organism. Those who eat too much fat soluble vitamins can develop what is known as "hypervitaminosis", a term that literally refers to the presence of an excess of one or several vitamins. The name given to this vitamin comes from the German word koagulation, since its role in regulating blood coagulation was discovered in Germany. 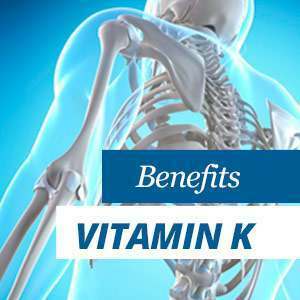 People who suffer from a vitamin K deficiency have repeteadly shown that they have an increased risk to suffer bone fractures. Vitamin K2: meats, eggs, dairy products, fish, fermented vegetable foods, fermented animal foods. Use of certain medications, such as antibiotics, medicines to reduce cholesterol, the use of aspirin, which can drastically reduce the levels of vitamin K in the body or interfere with its absorption. If you are suffering from a disease associated to the intestinal system, such as: Crohn's syndrome, Ulcerative colitis, Celiac disease, or any other that prevents the proper absorption of nutrients. Vitamin K can be purchased on this website. We advise the aforementioned stack or at least including vitamin D3 along with vitamin K supplementation.